The layout of Torino 4 is perfect for a large extended family, group of friends or two smaller families. Open plan living with a spacious dining area and large fully self contained kitchen occupy the middle level of this grand townhouse. 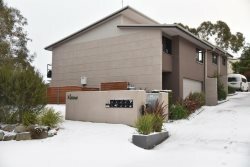 There is a large balcony from the lounge room over looking the magestic Snowy Mounatins and Main Range and the pristine Lake Jindabyne where you can BBQ in both summer and winter. The property has free WiFi for your holiday. Fully self contained well equipped kitchen. The lounge has electric panel heaters. The laundry has a washing machine and dryer [powder provided] and iron. There is a large double lock up garage with ski storage and internal access into the townhouse.